The 2015 Consumer Electronics Show highlighted the conversation around drones. Who has them, who wants them and WHEN will we be able to use them? Right now tens of thousands of drones are in the air causing a major safety concern to pilots of manned aircraft. Due to the small size and low altitudes in which these drones fly, Federal Aviation Administration Air Traffic Controllers are unable to safely integrate drones into the airspace. This is due largely in part that current radar technologies and ADS-b reporting systems are unable to locate and track the drones. We want drones. But first someone has to prove to the FAA that there is a solution for knowing 1) Where they are. Where are drones flying and how can we keep track of how many are in the sky. 2) How drones will avoid collisions with other aircraft. One option, let’s put more people on it. Add more air traffic controllers. Ok, it might work. However, this is not just a people problem. Agencies are dealing with two completely different cultures, one of innovation vs. one of safety. This is artificial intelligence problem that needs to be solved within the constraints of traditional safety methods. “In the technology world we reward innovation and speed, but in the FAA’s world they reward safety. LATAS is a viable solution that can reward both sides; giving aircraft operators a way to know where UAVs are before they become a safety concern,” said Tyler Collins, Director of Business Development for PrecisionHawk and creator of LATAS, which he introduced today at the 2015 Academy of Model Aeronautics (AMA) Expo. Say hello to LATAS, which stands for Low Altitude Tracking and Avoidance System. 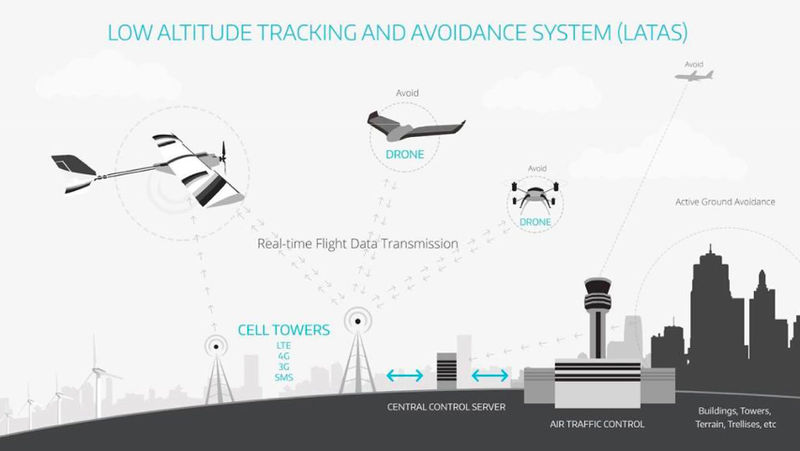 An onboard system that provides flight planning, tracking and avoidance for every drone in the sky using real-time flight data transmission based on existing world-wide cellular networks. Developed to be plug and play or integrated into a UAV’s circuit during manufacturing, LATAS is small (3x2x1in), light (>100G) and operational on network speeds as low as 2G. “The development of LATAS is based around the idea that we can use existing technologies at a low cost and weight, so we can avoid creating an entire new system and slowing down UAV integration,” Collins continues. Currently, we have a one way radar system. LATAS allows for two way communication. Other agencies are looking to develop localized radar stations that would need to be placed all over the United States, causing the FAA to spend hundreds of millions on infrastructure to locate the thousands of drones that will join the skies. By developing this automated air traffic control system, each platform has the intelligence to transmit its location and altitude in real time, which is sent to air traffic controllers and pilots in aircraft cockpits while reporting back to the FAA. The conversations have begun. Companies like Intel and Qualcomm, NASA and Google are spending heavy to develop the best solutions for wide spread integration, addressing sense and avoid and tracking. LATAS is the brainchild Tyler Collins. The first prototype came to life with a 3D printer, a hobbyist quadcopter and some spare time. He began identifying some of the key issues surrounding the hold on UAS integration and built the solution based on the issues he was seeing in the market. Collins tested the first prototype at the RC field in Raleigh, NC in the summer of 2014. Tweet us your questions @PrecisionHawk or @LiaReich.